Promotional value expires 120 days after purchase. Amount paid never expires. Must print out voucher. Limit 1 per person, may buy 1 additional as gift(s). May be repurchased every 30 days. Valid only for option purchased. Merchant is solely responsible to purchasers for the care and quality of the advertised goods and services. Keepers of the Wild founder Jonathan Kraft has always loved animals. As a child in Holland, he rehabilitated and released injured birds every winter. When he became a magician performing grand spectacles in Vegas, his affinity for animals led him to raise two baby tigers to integrate into his act, then eventually acquire and train more big cats. At first Kraft didn’t see the connection between his chosen career and the prevalence of animal mistreatment, but gradually he began to realize how cramped, stressed, and unhealthy his peers’ animals tended to be. His first steps toward rescue weren’t ideal—he didn’t have the space to give each animal the sprawling habitat it craved. So the next step was Keepers of the Wild a place designed to rescue exotic creatures from inhumane conditions and let them roam both safely and freely. 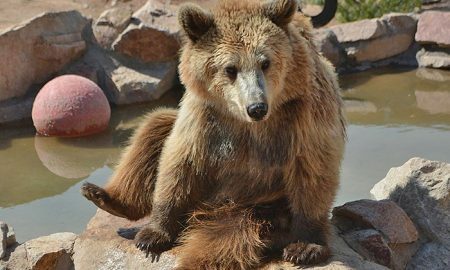 The center, located on historic route 66, now hosts more than 175 animals that include lions, tigers, leopards, and monkeys. Walking and hiking trails lead to enclosures where cougars lie in the sun or wolves trot between bushes. Plenty of lookouts offer photo ops or a chance to spy on capuchin monkeys’ poker games. Visitors can explore the grounds on their own or hop on a guided tour, where they’re shuttled to various habitats and can watch the predators feed.